As warmer weather is approaching, we’re shifting how often we use the oven. It doesn’t matter if you have air conditioning, the oven turned on in the late spring and summer makes for a really warm kitchen. We cook a lot of things stove top, use our George Foreman or go outside and grill. For this recipe, all you need is pots and pans and some tongs. 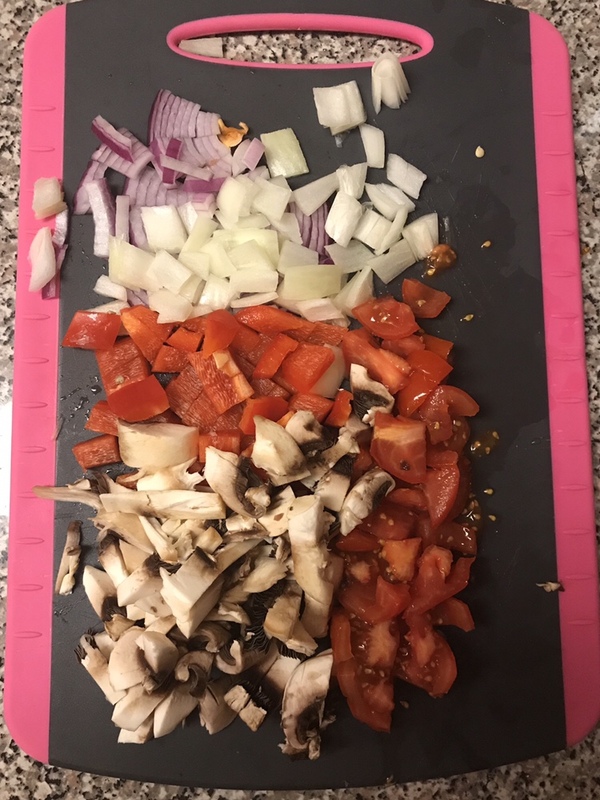 As we’re getting back into our routine of having dinner together again since the semester is over, I’ve been trying to incorporate meals that take a little longer or utilize entrees that may have a little assembly. I don’t need to rush dinner or have it in a Tupperware anymore, so this is a perfect opportunity to use corn tortillas. I’ve made BBQ chicken tostadas before and since I had shaved steak I looked to see if there was a recipe that would be similar that I could check out. Here’s what my Pinterest search looked like. So I skimmed through a few recipes and then decided to throw my own thing together. 1. 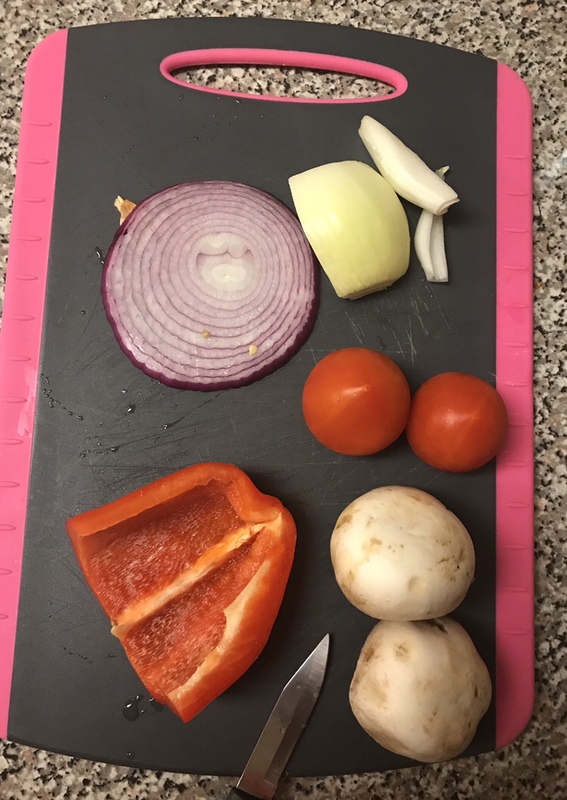 Wash and chop vegetables into small pieces. They don’t need to be minced, but should be close to bite size. 2. Spray a medium sized pot with cooking spray and add vegetables. Put on medium heat. Stir occasionally as vegetables sweat. 3. 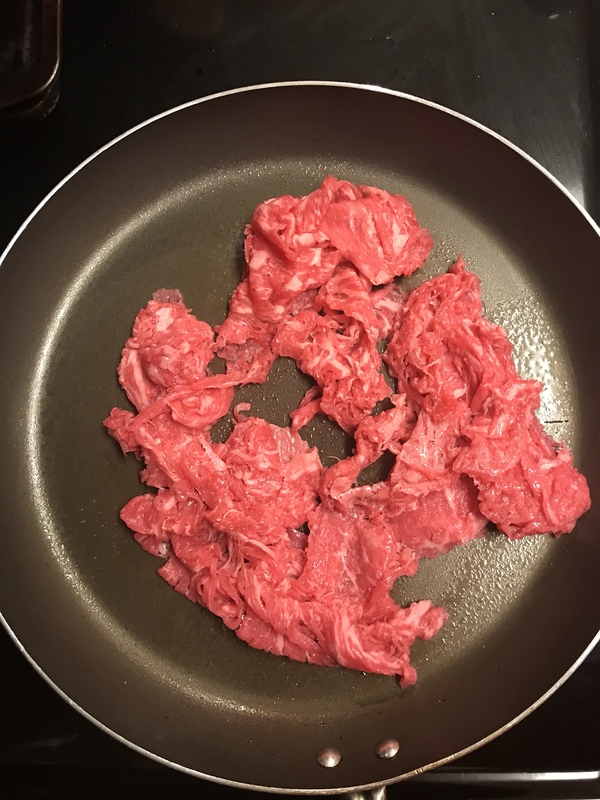 In a separate pan, add shaved steak and seasoning blend. 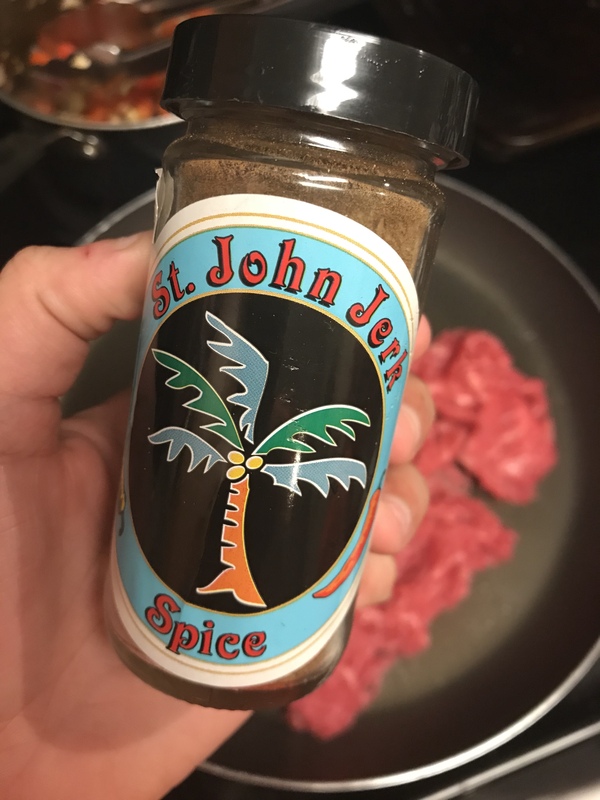 I used Jerk seasoning, but you could use something smokey or spicy for this recipe. Put on medium heat so you don’t burn the meat. 4. In a small pan, spray cooking spray or use a little bit of olive oil (with a paper towel) to lightly coat the bottom. Put on high heat to get pan to temperature, then decrease heat to medium/medium-high. Place a corn tortilla until you see air pockets form and the bottom side of the tortilla is browned. This should take a few minutes if the pan isn’t warmed up yet, then flip and let second side to brown. Repeat this for all corn tortillas. You may need to spray or wipe olive oil in between tortillas. 5. For plating, place a corn tortilla on a plate and spread plain Greek yogurt, I used a spoonful. 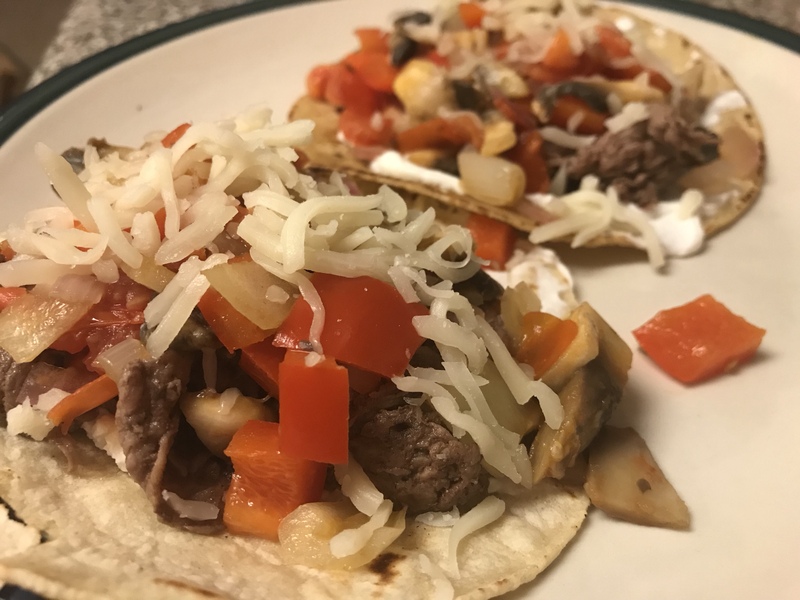 Since this recipe makes two, I used half the steak for both tortillas, then added vegetables followed by shredded mozzarella cheese. Many recipes called for mozzarella, but you could use cheddar or a blend – whatever you prefer. As always, nutrition will change based on brands and cuts of meat. If you use a different cut of meat, it may has more fat and therefore more calories. 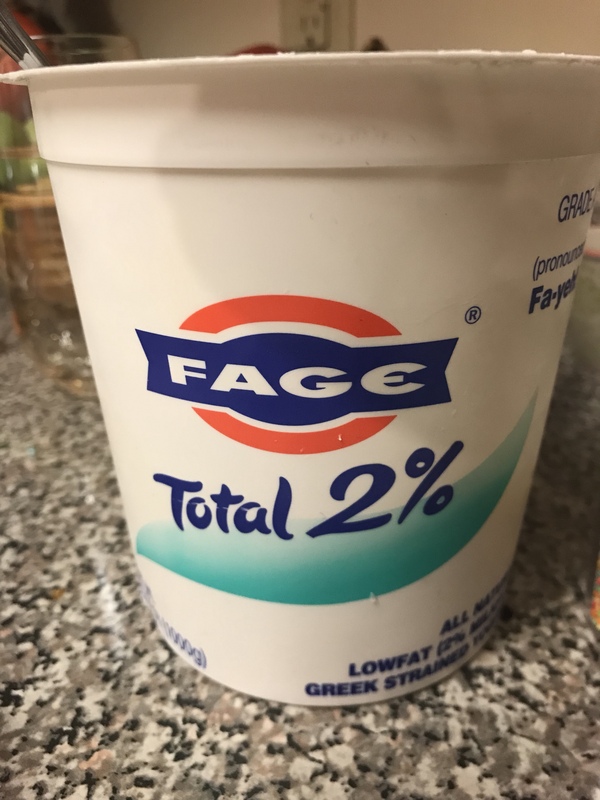 If you use more or less vegetables, etc. If you want to check out the recipe that had inspired my BBQ chicken tostadas a while back, here it is!